Published Jul 3, 2018 By Julia 36 CommentsThis post may contain affiliate links. 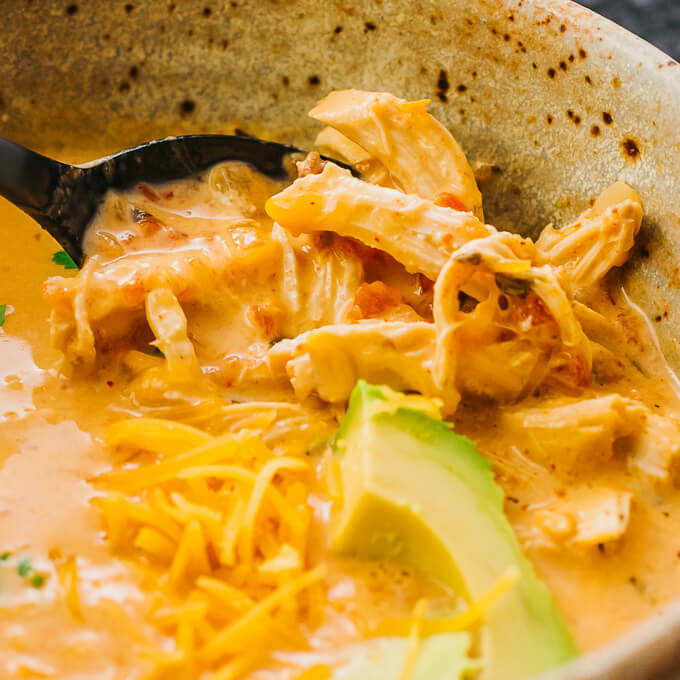 A comforting and creamy Instant Pot soup with shredded chicken, fresh salsa, and Mexican flavors. Low carb, keto, and gluten free. 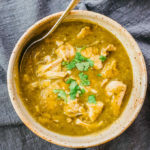 I usually make my meals from scratch (like this recent Instant Pot Chili Verde), but every once in a while, I enjoy pulling together an effortless meal that uses some pre-made components. 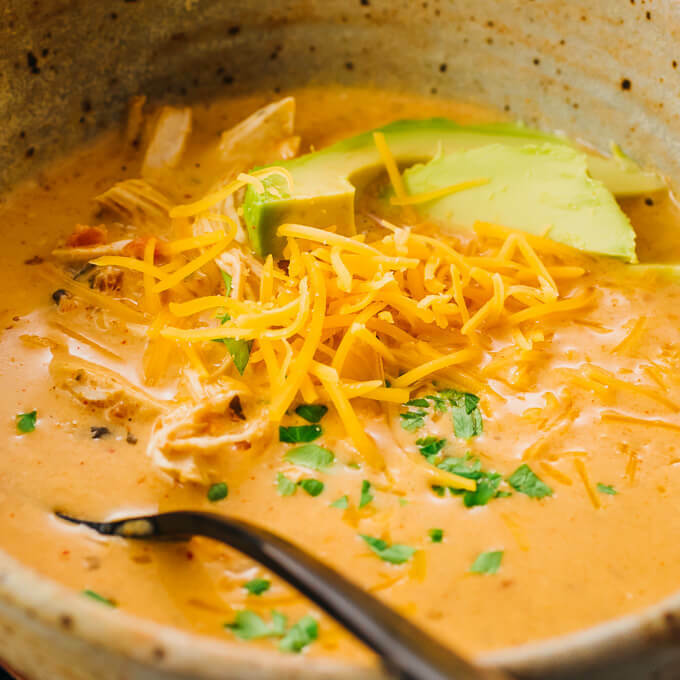 For this salsa chicken soup, I use store-bought salsa (instead of making my own) and a pre-made taco seasoning mix. Both add a ton of flavor, with little work required. This is not quite a dump-and-go pressure cooker recipe, but it comes close. After pressure cooking the chicken, it needs to be shredded. And cream cheese is added to the soup, which gives it a creamy and rich texture. But that’s about it. Overall, it’s a really easy recipe that deserves a spot in your weeknight dinner rotation! Chicken breasts. I use skinless and boneless fresh chicken breasts. Frozen is fine, but I recommend thawing overnight in the refrigerator. If you add frozen breasts directly to the pressure cooker pot, the resulting soup might be a bit more watery. You’ll also need to increase the pressure cooking time. I haven’t tested this recipe using chicken thighs, but they should work well. Chicken broth. I use a low sodium broth, to avoid an overly salty soup. It’s always easy to add salt to taste after the soup is done, but impossible to take it out. Cream cheese. Any full-fat, regular cream cheese will work. I prefer the Philadelphia brand. Don’t buy cream cheese spreads or light versions of cream cheese. And don’t skip this ingredient — it adds substantial creaminess to the soup. Salsa. I use fresh salsa that you can find in the refrigerated section of a supermarket near the produce. I don’t use jarred or canned salsa. Note that salsa is not the same as pico de gallo; salsa is thinner and pico de gallo is chunkier. I recommend buying mild salsa if this is your first time making this soup. The taco seasoning will provide the heat and you don’t want to end up with soup that’s too spicy to enjoy. Taco seasoning mix. You can find this in the spice aisle of your supermarket. I use Trader Joe’s taco seasoning mix, and I find that 4 teaspoons provides an adequate level of spiciness. If you can’t handle spices well, I’d dial it down to 3 teaspoons or less. After the soup is cooked and ladled in bowls, add your toppings just before serving. I’ve offered some suggestions in the recipe below — avocado, shredded cheese, cilantro — and you can add whatever else strikes your fancy, like sour cream or crumbled Mexican queso fresco. The soup is also fantastic as-is, without any toppings. 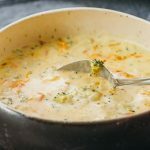 You can serve this soup with low carb almond flour biscuits, roasted cauliflower, or a simple green salad. 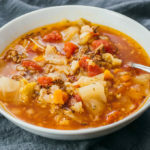 This is a somewhat hearty soup, especially if you double the servings (each serving is 1 cup), so I typically serve it as the main course. Covered leftovers store well in the refrigerator. Before serving, use the microwave to reheat the soup until warm. Think this recipe would be just as good in a reg pot on the stove? Lol I cannot figure the insta pot out (palm to forehead)! The Instant Pot is just an electric pressure cooker and any other brands would work as well. I think this recipe would also work in a regular pot on the stovetop, except that you would need more liquid (pressure cookers are very good at retaining liquid compared to stovetop) and you would have to increase the cooking time. Hope that gives you a start! Cream cheese does not freeze well. It becomes grainy. So delicious! I made this for dinner and I love the creamy flavor. Thanks for sharing the recipe! If I want to make this in a crockpot, do you have a recommended cooking time? I would probably try 3 hours on high or 6 hours on low. Essentially, the chicken needs to be cooked long enough so it’s easy to shred. Hello! This recipe looks amazing and I plan on making it this weekend for the work crew! Just wondering if you put in thawed chicken or frozen or if it even matters. Thanks! I recommend thawing the chicken beforehand. After thawing, pat them dry with paper towels to avoid adding excess liquid to the soup. Hope you guys enjoy it! Learning cooking times with meat. Keep the pressure cooking time the same. Let me know if you have any other questions. OMG just made this in my brand new instant pot. It is DELICIOUS! Thanks Nancy! Reminds me that I need to make this again soon so that I have some healthy lunches prepped. 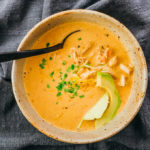 I do not have an instant pot can I make this in a crock pot? I haven’t tested this in a slow cooker so I can’t say what the cooking times would be, but I think it could definitely work. I made this last night and it was delicious! I was meal prepping, so I haven’t tried it with all the fixins’ yet, but just the flavor of the soup is wonderful. I wanted to stretch it a little further so I added a lot more chicken stock. Didn’t end up super thick but once I add toppings and reheat on the stove I’m sure it will be a-ok. This is a good recipe! I use ground chicken sometimes instead of the breasts. I use a deep bowl and an immersion blender to smooth the cream cheese into the 1c. of soup. Made this last night, but also made my own taco seasoning with just a 1/4 tsp salt to cut down even more on the sodium. It was awesome, topped with avocado. Fantastic! I’m glad you enjoyed it and even made your own taco seasoning 🙂 Adding avocado chunks really takes it to another level! Yummy, easy and surprised me how good it was for summer. Give it a try, you won’t be sorry. Great and easy. I added some chopped fresh tomato on top and my non-zero husband sprinkled crushed taco chips on top. I made this soup and my whole family loved it (parents and 2 and 4 year olds). We used chicken thighs because that is what we had and also added some corn and 4 beans to it. It was easy and tasted beautiful. Thank you for another beauty Julia. 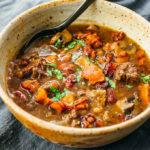 I am not yet an experienced Instant Pot user but I found this recipe very easy to make. It was also delicious; creamy and cheesy and very filling. In addition to the cheese, cilantro, and avocado as garnishes for the soup, my husband used some tortilla chips that he crunched up with his hand. He loved including the tortilla chips. I would recommend this recipe to anyone whether they are at home with the Instant Pot or new at it like me. We made this for friends and it was a huge success! We added some chopped, fresh veggies we had on hand (carrots, celery, onion). It was very spicy, which is why it was devoured by the group. When you remove the cooked chicken, add the cream cheese cubes to the hot liquid in the pot, blending until melted, then add the chopped vegetables and pressure cook on high 5 minutes with a fast pressure release. While that’s cooking, you can shred the chicken and add it to the soup after releasing the pressure. Deliciously easy! Served with lime wedges, avocado and sliced fresh jalapeños – yum. Love this soup. I used leftover taco and salsa sauce and used shredded chicken I already had and this was a Big hit with the family.